Welcome to my website. It has information about my books, and I look forward to hearing from you if you read them. My blog is about what inspires my books, and the people and places I encounter while travelling with them. My fiction has been published by small independent publishers, and I’ve been lucky to win or be short-listed for prizes for all of them. 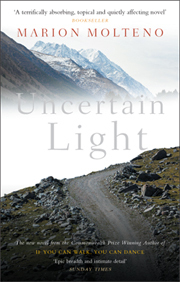 My latest novel, Uncertain Light, starts when a peace negotiator is taken hostage in the mountains of Tajikistan. It draws on my experience of working internationally for Save the Children. Uncertain Light and Somewhere More Simple – set on the Isles of Scilly,were shortlisted in successive years for the International Rubery Book Awards – (described as ‘The Booker of Independent Publishers’). If you can walk, you can dance won a Commonwealth Writers Prize for the best book in the Africa region. A Shield of Coolest Air, about asylum seekers in London, won the David St John Thomas award for fiction. I am currently working on a series of memoirs, which are being published in edited collections. What Was Once A City, about my first few months working for Save the Children, won 1st prize in Fish Publishing’s international memoir competition. There’s more about my life and my writing in the section My Story.